A modern practice of vastu has traveled a long way from its origins. If you feel that good energy helps you to improve your life, consider Vastu as your way of life. Mumbai has been a pioneer center for the spiritual enlightenment and vastu is not an exception. People in Mumbai are over worked. You will find them always busy and working all the time including holidays. People of Mumbai are well aware of the vastu concept. Many of them have already consulted with Vastu Consultant in borivali for their either a current home or new home to strengthen their luck. Vastu environment is always refreshing and peaceful. Main entrance of the house is located in the “Inauspicious Zone”. The main entry is very important in the vastu analysis because it is through the main door that the house absorbs its flow of energy. We call it a nourishing energy. Door towards the south-west causes short life and a very serious bad luck, if not corrected. House has an irregular shape. Vastu always recommends buying rectangular or square shape premises. Irregular shape creates an imbalance in the premises. Most of the imbalances spell trouble for the occupant. The irregular house also creates a deficit i.e. something missing. Kitchen in the south-west predicts trouble for the female member of the house. According to Vastu, south-west is governed by earth element. Locating fire in the south-west zone brings serious illness & financial worries. 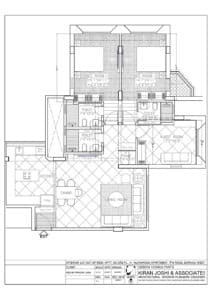 A prayer room is planned in the center of the house. A toilet opposite to the prayer room is highly inauspicious & a bad vastu arrangement. As a result, pollutant energy of toilet area disrupts the tranquility of the prayer zone. A sleeping direction with head towards the west needs change because it causes lack of a quality sleep. Neutralize a defect of the main door by concealing a copper pyramid chips inside the door frame. Also, a Dakshin Mukhay yantra should be placed above the door duly blessed by learned purohit. We have suggested installing a vastu clockwise arrow since the door has an anti-clock movement. Keep a painting of endless path on the wall facing the door. It gives a feeling of depth towards the north. Place natural yellow aventurine pebbles under the flooring of the south-west zone to enhance earth element energies. In addition to the above, the citrine rock in the south-west of the master bedroom will enhance the earth element in the personal area. Counterbalance a defect of the Southwest door with a pearl & marble pot in northeast zone. Balance the shape or missing an area by putting a vastu copper bricks on the wall having a missing area. Other important placements have been marked on the vastu plan like Bed location, room specification, Money location, Kitchen arrangement, study desk, colors for each room and also temple specification. Enhanced North-east (Vastu element-water) by placing multiple water features like water crystals, fountain, water pyramid etc. In addition to the above, Energize house by installing various vastu enhancers. It brings more prosperity, growth and also success. About Borivali:- Highly popular suburb Borivali or Borivli is located in the north-west section of the Mumbai island of Maharashtra. It has tourist attractions like Sanjay Gandhi National Park, Gorai Beach, Waterkingdom, Essel World & also Global Vipassana Pagoda.